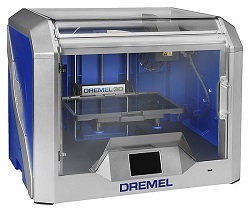 This Dremel Model for Education includes an additional USB flash drive pre-loaded with 10 print-ready curriculum based model files. The new Idea Builder comes with an innovative clog-resistant extruder to protect your models from failed builds. With the 1 year warranty and UL safety certification, you can rest assured that your Idea Builder is safe and reliable to use. The new 2 point assisted leveling will allow for fast and accurate calibration so you can start building on right away. Dremel Idea Builder 3D40 comes equipped with a pre-installed extruder, unlike other 3D printers that require you to install it yourself. All that while the expanded build plate is designed to fit objects up to 10” x 6” x 6.7” so you can create bigger projects.